Be met at the airport and transferred to hotel. 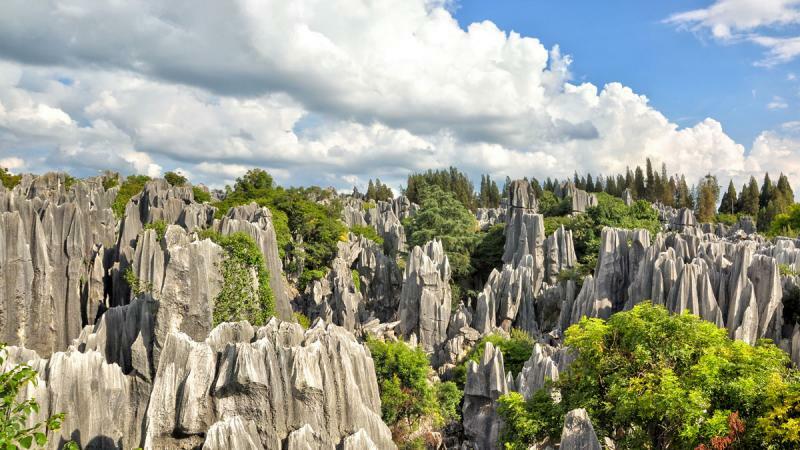 A full day trip to the Stone Forest, and visit a minority village on the way. Then have a stroll around Green Lake. Fly to Dali by morning flight. Be met at the airport and transferred to hotel. Then visit Xizhou town, free time for your own exploration at Dali Ancient Town. 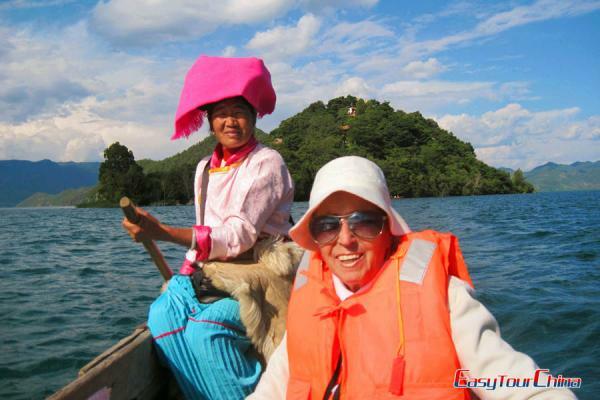 Enjoy boating in Erhai Lake, then visit the fishing village nearby. In the afternoon, go to see the famous Three Pagodas. Transfer to take train to Lijiang (2 hours). -The Three Pagodas: An ensemble of three independent pagodas arranged on the corners of a equilateral triangle, near the town of Dali, dating from the time of the Nanzhao kingdom and Kingdom of Dali (937-1253). It has been a landmark of Dali City and selected as a national treasure meriting preservation in China. 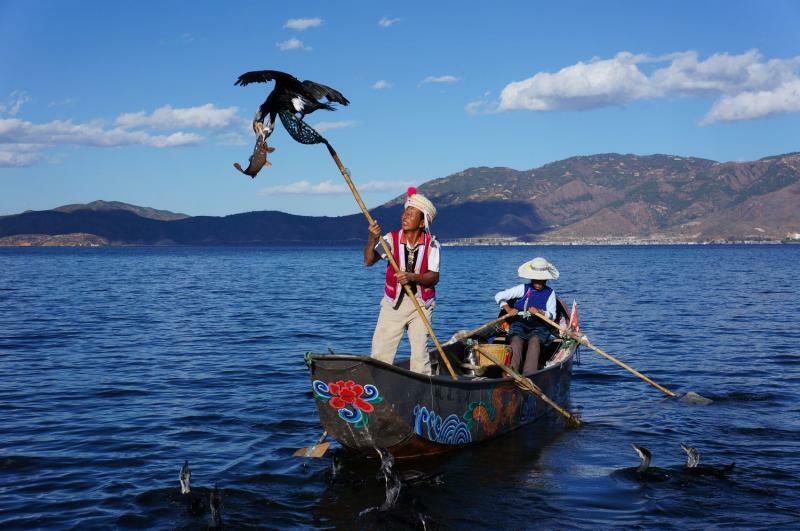 -Jade Dragon Snow Mountain: The holy mountain of local Naxi People, the soul of Lijiang. -Baisha Mural: It was painted in Baisha Town in Ming Dynasty (1368-1644), an interesting co-existence of Buddhism, Taoism and Lamaism in the artworks. 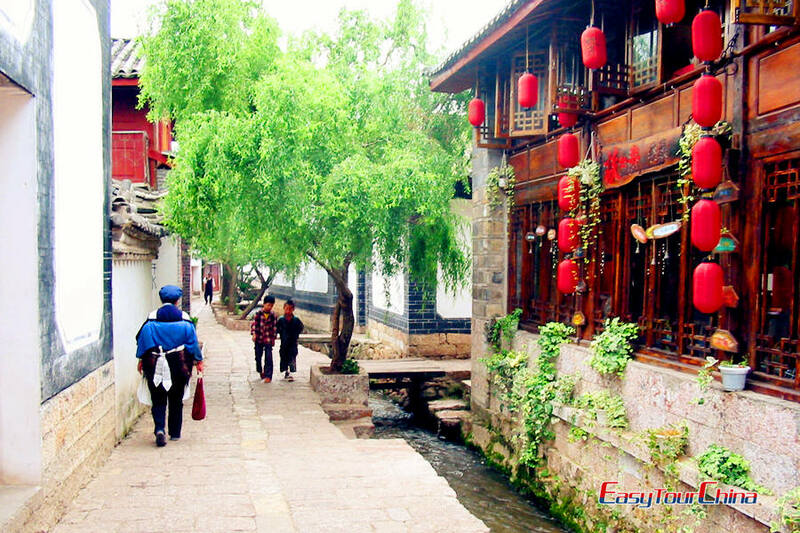 After breakfast, visit Lijiang Old Town, Lion Hill, Wangu Tower and Black Dragon Pool Park. The rest of the day is for your independent exploration. -Lijiang Old Town: Originally called Dayan, Lijiang is a very well preserved old town built by Naxi people with unique cultural background. It was listed as the World Cultural Heritage Sites in 1997. Transfer to Shangrila by private car. 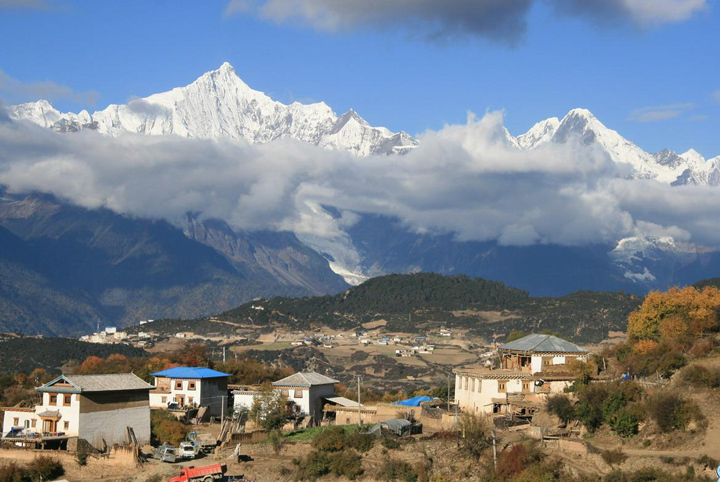 On the way, visit Shigu Village & the First Bend of Yangtze River, Tiger Leaping Gorge. 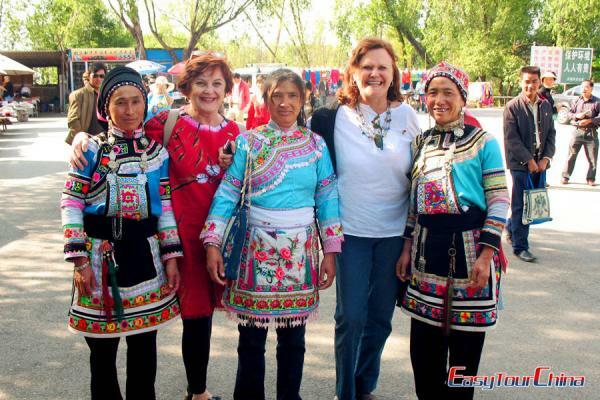 - Shigu Village & the First Bend of Yangtze River: Shigu Village is 50 kilometers from Lijiang. It was named after a stone tablet in the shape of a drum. The Jinsha River does a U-turn at Shigu Town and flows northward, which is known as the First Bend of Yangtze River. - Tiger Leaping Gorge: Tiger Leaping Gorge is a canyon on the upper reach of the Yangtze River, legend says a tiger could jump across the river at the narrowest point (still 25 meters wide), hence the name. Tiger Leaping Gorge offers a pleasant walk through spectacular scenery. After breakfast, drive to explore Pudacuo National Park and Nixi Pottery Village; and end the day with the visit to a Tibetan family. 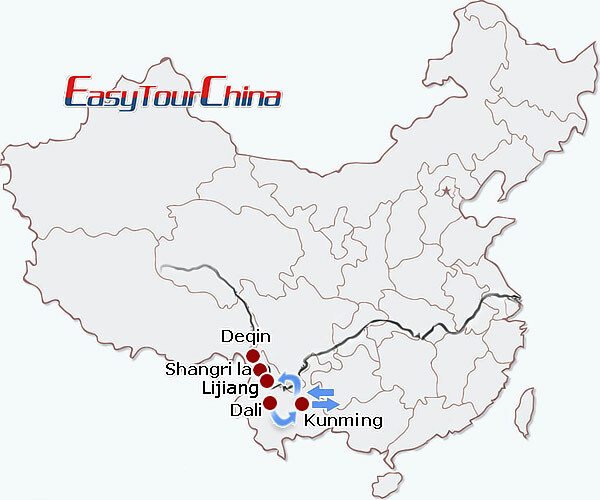 9 Day 9 Visit Tibetan Songzanlin Monastery, Great Bend of Yangtze River, etc. After breakfast, visit Tibetan Songzanlin Monastery, then proceed to Deqin by private car. It takes about 6 hours to complete the 187-km tough journey, while the view along the way is fantastic. Visit the Great Bend of Yangtze River, enjoy scenery of Jinsha River Valley, wooden workshop at Benzilan town en route. 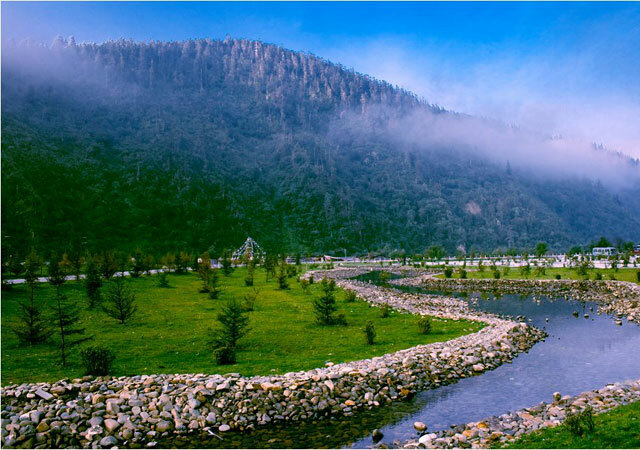 After lunch, visit the Dongzhulin Lamasery, and pass through Baimang Snow Mountain Nature Reserve. 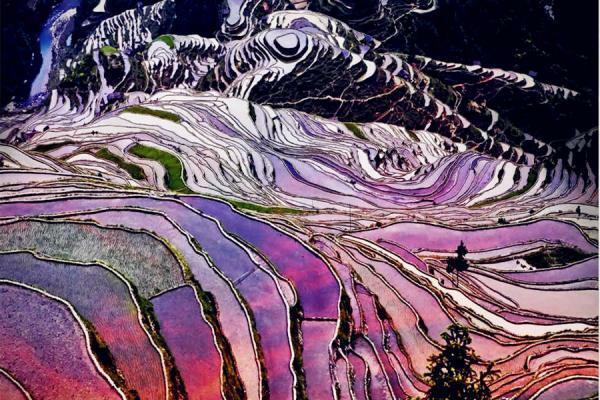 Get up early in the morning (boxed breakfast), drive to Mingyong village, and stop at Feilai Temple to enjoy the sunrise of the Meili Snow Mountain (if weather permits). After lunch, start hiking from the village up to Meili Snow Mountain (or optional ride on horse/mule). After about 3 hours walking, arrive at the Taizi Monastery, a good spot to look at the magnificent Mingyong Ice Glacier. Later drive back to Deqin County. After breakfast, drive back to Shangrila. Relax at the rest of the day. Transfer to fly to Kunming to connect your flight to the next destination.